Detailed steps to reproduce the bug (exactly how and when did it happen). Answer: Step 1) Begin playing the H5P interactive video with two summary questions. 2) Watch entire video until Summary section. 3) click Summary, answer questions - see screenshot. 4) Go to Gradebook, no values appear. 5) Check Results report for the activity, "Gradebook score: 100 out of 100" but nothing is displayed under "Your Answer" section. See screenshot. H5P plugin version. Not sure, how can I check? H5P content type and version (if a content type was used), and a sample URL or attached H5P. Interactive video, not sure how to check for the version. Any browser console errors. Not sure how to check for this. Any PHP errors. Not sure how to check for this. Screenshots if it's a visual problem. 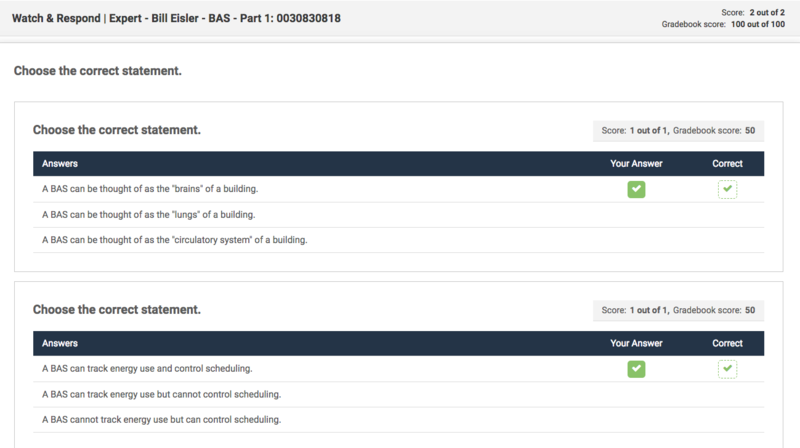 Answer: not a visual problem but screenshots provided to show the answering of the questions in the summary and the result screen which does not show answers were recorded. I'm a bit confused, the screenshot you provided "no_your_answer_shown_" shows the scores and answers provided by the user. Sorry for confusion and thanks for your help. It appears for the students that do not get their grades passed to the gradebook, the "Your Answer" is blank (as shown in the no_your_answer_shown.png). The only reason why other students don't get their answers and scores recorded is that they did not finish the video. IV sends the scores to the Gradebook once a "finish" event is created, this happens once the video reaches the end. I sent an earlier comment today about an issue that popped up after we updated to the Interactive Video library from 1.17.2 to 1.19.4. (H5P version 1.10). After I updated the library yesterday, no Interactive Video grades would post in the Moodle gradebook. We have several hundred Interactive Videos this is affecting. It was found that the Interactive Video will add the grade into the Moodle gradebook if we manually go in and add the Submit Screen to each of the Interactive Videos (we have 393) by clicking on the star and adding this Submit Screen at the end of the videos. Is there a way so we do not have to go in and manually add this Submit Screen to each video in order for students' grades to automatically post in the Moodle gradebook as they did before this update? Site Administration -> plugins -> plugins overview, and look for H5P. I tested this with the example content at H5P.org and was not able to reproduce the bug that you described. Do you have a copy of the Interactive Video content that you can share with us so we can try to reproduce it there ? Make sure that the users that you want to save score for has the 'mod/hvp:saveresults' capability in Moodle permissions. If you're able to reproduce this consistently, please check for any errors in your browser's console and PHP error log when this happens. Also be aware that the score will only be updated the first time you reach the end of the video, so if they went to the end, then filled in all the answers, then went back to the end of the video the new answers will not be registered, unfortunately. 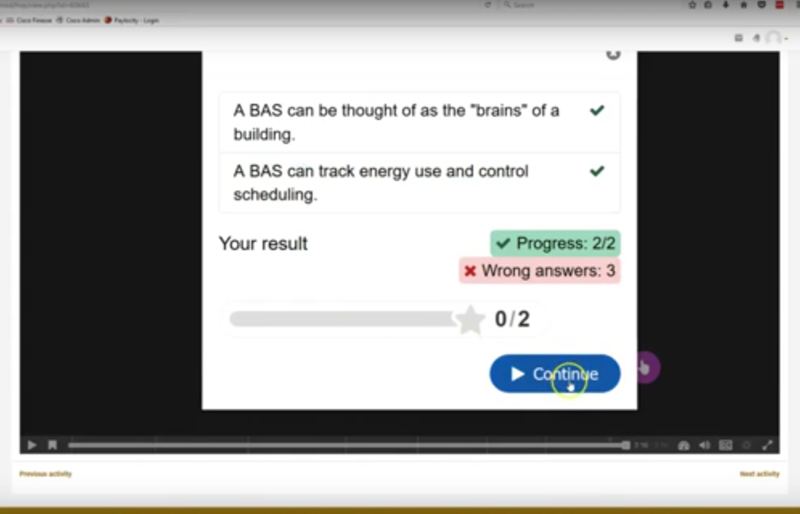 We're soon releasing a new version of Interactive Video that will give control of when the answers are submitted to the users, if your issue is caused by scores not being properly sent in to the gradebook, the changes we introduce in this new and improved version will solve your problem. Thanks for your reply Thomas! We have a test video that replicates the issue but would prefer to share it via email. Do you have an email address we can share it directly to? Have you been following the advice of Thomas in the meantime? Your plugIn version is really outdated. We're currently at version 1.9 with many improvements, and the latest version of Interactive Video contains the submit feature that Thomas mentioned. We are on Moodle 3.2, with Interactive Video library versions 1.15 and 1.17 installed. This was reported by students to their professor, who reported it to me, the Moodle admin guy. The students noted an odd anomaly in the way grades show in the grade book. Sometimes, for the same interactive video, it will say there are 2 points possible, other times it will say 3 points possible. For example, in interactive video “1.4 lecture,” there are two fill-in-the-blanks questions and a summary task. The total points possible is 10. One student got 10 points, another got 6.77 points. In the gradebook, we click the little magnifying glass to show the “Results for” page, the first student shows she got 2 of 2 correct, the other shows she got 2 of 3 correct. So, one student gets graded on 2 questions, the other on 3 questions. Shouldn’t both be graded on 3 questions, the fill-in-the-blanks questions and the summary task? We are hypothesizing that one student did the summary task (and got it wrong), and the other skipped the summary task, and it didn’t count at all. Is that possible? Any other idea what might be going on here? You are correct, only questions that has been loaded and attempted are taken into account for the final score. So if you completely skip a question that will not count towards the final score. The reason behind this logic is like this is among other things that there are ways to branch Interactive Video into different paths, in these scenarios you would not want questions that the student is not lead to take to be taken into account for the final score, we also do not load activities before they are encountered. We're aware there's room for improvement for the scoring of Interactive Video, and we're continually taking measures towards it, recently by introducing the score screen for version 1.17. Hope that helps dispel some of the mystery around the scoring in this case, and thanks for the feedback. Does 1.19 work the same way? OK, thanks for the clarification and rationaile. Does 1.19 work the same way, i.e., doesn't count the question if they skip it? (I may be able to upgrade to 1.19 mid-semester if it will help....) If so, have you got any clever ideas to solve this issue? There are approximately 60 interactive videos in the course, it would be a bummer if she had to change them all..... Cheers! Hi, 1.19 works the same way, yes. There is a "prevent skipping" behavioural option in Interactive Video, you could enable that and set a score screen at the end of the video, this may be a possible workaround, but there will be no robust solution until it is solved properly I'm afraid. The score screen is the screen you get when clicking the "star" icon on the timeline of the Interactive Video, you can see it in our example content at: https://h5p.org/interactive-video. The behaviour is also very confusing for our staff and students. It's not how you expect it to work. If you conduct an exam and you skip questions you lose the points for those questions. I'd really love to see an option here to make skipped questions count to the total result. I apologize for the inconvenience and thank you for your input. By score screen, do you mean the "Results for" page I mentioned earlier, where it shows "2 of 2" or "2 of 3"? Cheers! What Thomas meant was the submit/scrore screen that can be triggered by click on the star icon in the slide bar of the Interactive Video. Please note that I filed a bug report and you can follow it here. A day or so ago, I asked you about the problem we were having where our YouTube videos continuously looped even though this feature was not checked. Even though we updated H5P to the version 1.10 the beginning of September, new libraries appeared a day ago which I updated. I updated the Interactive Video library (from 1.17.2 to 1.19.4) and the YouTube videos stopped continuously looping. Now students' grades are not saving in the gradebook for any Interactive Videos. I (and others) have made sure several different videos ran to the end - we know videos must run to the end for scores to post. The student system role setting "mod/hvp:saveresults" is set to "allow" as it should. Sorry for the recent influx of issues, but we love the Interactive Video (currently have 393 instances), so this is impacting hundreds of students. Any ideas as to what I can try to fix this? I have attached an H5P, but again, this seemed to have happened after I updated the Interactive Video to 1.19.4 yesterday and affects all videos. To improve upon some of the issues mentioned in this thread the new submit screen features was added allowing authors to add a submit screen that sumarizes the users activity and let the user actively choose to submit her answers. The idea was that if you had the submit screen any other submitting of grades and answers would be disabled and if you did not have the submit screen (typically for existing content) the old behavior should remain. Unfortunately this was lost in translation somewhere and a "bug-fix" completely disabled the old behavior so if you don't have the submit screen there is no way to submit your answers. What would be your advice in terms of the severity here. Should we put effort into fixing this for old content or encourage users to add submit screens to their old content using the star button instead? The submit at the end of the video never worked very well, so I'm not sure how many relies on it. Are you telling your students to make sure that they watch until they reach the very end? Hi, thanks for asking for input on this topic. My vote would be to fix this for old content, rather than focussing on the submit screens. To be more precise, fix for old content first, then do the submit screen. I do like the submit screen as a solution -- I think that once its in place it would be best practice to always use this because it makes clear to stsudents what grade they'll get (unless, by closing the browser window they get an opportunity to retry....). But, like others, we have so much content already that fixing the system is better than fixing the content in the short term. Sorry to want the quick fix to have priority over the long-term solution, but I'm trying to prioritze the needs of current faculty. Thanks again for asking the question! Cheers! Your vote is noted. We're delayed with the "September release" and have a lot of other deadlines ahead of us from organizations sponsoring new features. We advice that you add submit screens. Adding submit screens to 60 H5Ps will be many, many times faster than for us to create, test and release a fix. I appreciate your quick response and the information. Also, I am sure the students did go all the way to the end of the videos. I also replicated the issue and made sure the video(s) completely ended as it needs to do. Again, we are adding the submit screen ourselves so no further action is required on our part, but I appreciate your offer of trying to fix it. Thank you for the reply. I'm sorry you have to add all these submit-screens in a hurry now because of the mistake that was made with Interactive Video. The job will at least not be wasted - the submitscreen should make the content better. We've had a lot of reports from teachers telling us that their students closes the browser when the video has clearly ended (it is showing subtitles for instance), but before the very last second of it. I was curious as to how you make your students wait until they reach the very end. When reaching the end unlocks the next content they probably quickly learned how it worked. Warning: The computer will not recognize your responses or award credit unless you play the video from the start to the very end. Many of our students take courses both on and off campus. On-campus students go to a computer lab daily where a tech monitors and helps students follow instructions completely for items such as this. Also, I always log in “as the student” to verify any issues reported. Bottom line is that students learned quickly the videos needed to be watched until the very end before they could move on in a course. I do agree that the new Submit Screen was needed as it provides a concrete way for students to submit Interactive Video responses, so appreciate the work you have put into this. Thank you! Thank you for your feedback. It is good to know!